On your way to Tsitsikamma National Park, we took the scenic drive down to Natures Valley, slowly descending through virgin rain forest jungle, to immerge at the deserted and long sweeping beach. Percy had thoughtfully brought along a cooler box packed with a picnic and cold drinks, while erecting deck chairs and sun umbrellas. The perfect spot to just relax and munch, while hearing the waves lightly crashing against the sandy beach. Getting through the gates of Tsitsikamma National Park, is a little reminiscent of driving to Cold War Berlin, maybe not in terms of austerity but in terms of formalities and passes. Having been thoroughly quizzed and displaying our “red pass”, we continued into the park taking the windy road down to the thankfully not so busy car park. Tsitsikamma is a National Park that stretches many kilometres along the coast and offers routes that hug the coast line and meander up and down the forest. Such a route through steep terrain would normally be reserved for the serious hiker but an elegant and simple boardwalk has been ingeniously installed. This allows the young, the unfit and the active senior to skip up and down the cliffs, in and out through the forest, allowing all ages to enjoy nature at its best. 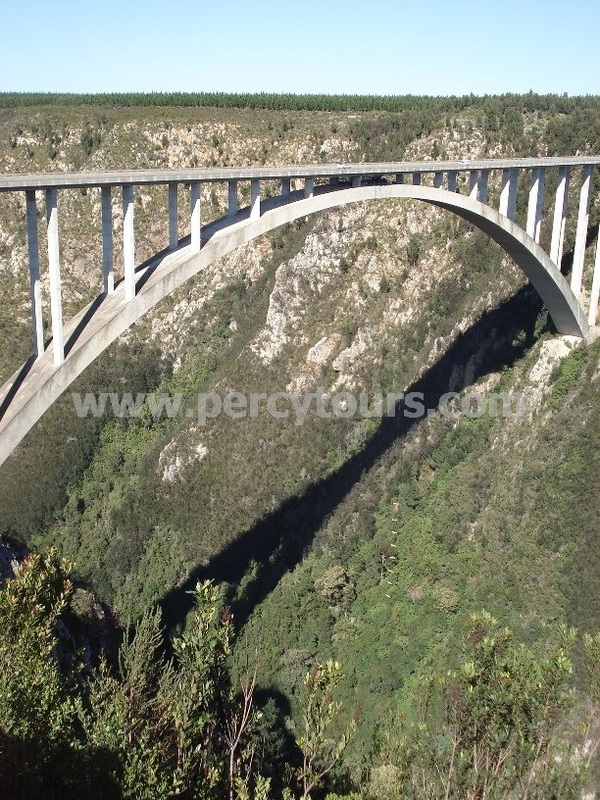 We take the less ambitious walk to the Storms River suspension bridge and back, the more dedicated hiker could follow the path on up to the next peak, or if you are really keen and better prepared, you can even sign up for a 2 or 3 day hike along the Otter Trail, that utilises chalets strategically placed along the route for over night stays. If you like your nature with lots of oomph then the Tsitsikamma landscape won't disappoint, as at every turn nature seems to flick its wrists to magic up another breathtaking view. Tsitsikamma is like a one horse town without a horse, that's not to deride it in anyway, although it does look like a set from a spaghetti western, with its wide dusty street lined with businesses that would look unusual even in Unusual Street. Take for example the Cadillac Shack, this is not the place you would expect to find a Cadillac museum. But there it is, the bright pink building working in harmony with the bright and pastel shades of some fine glory day Cadillacs. Michael Caine might tell you that the Big Three Cadillac's are the '58, '59 and '60 as they have the biggest fins of all the Cadillac's. Tsitsikamma will tell you that possibly, unlike anywhere else in the world, you can see all 3 of them in their high street. What the Cadillac Shack museum is doing here, in the middle of nowhere in particular, is anyone's guess, but it is next door to the bright blue building with the words “Bubble Gum” over the door. Which before you ask, I have no idea if it was a shop, a business or simply the worlds premier “Bubble Gum” museum. Whatever you do, don't take hallucinogenic drugs before visiting Tsitsikamma, there is no knowing what will happen when psychosis-distortion meets the surreal head on. Percy shows me round the Tsitsikamma village hotel and I make a mental note that it would be a lovely place to stay for a couple of days. You don't expect this one horse town to have a 3 star hotel, but then again you get used to Tsitsikamma surprising you. With its pioneer style guest lodges, all bright, airy and arranged around a central square all facing each other. The village hotel brings some class to go along side the Bubble Gum store. We came to Tsitsikamma though not for the Bubble Gum, the Cadillac's or even the Village Hotel, I was here instead to sign up for the Storm Rivers tree top canopy zip-lining tour. If you have any genuine fear of heights you can forget this activity, but if you are game for something unusual it is a 3 hour experience that you are unlikely to forget. I slide into my harness, put in a crash helmet and a pair of gloves and made my way to the “Swuffy Slide” steel cables suspended between the high tree tops. The first tree to tree slide is a gentle 10 metres above the ground and only 10 metres from tree to tree. This slowly starts to get longer and higher as you progress thro’ the forest. Leading to some that are 30 metres high and 40 metres across and don’t worry about screaming, as that’s all part of the experience too. I'd like to tell you otherwise but it is not as scary as it sounds and if the truth was told you are actually safer up in the trees than you ever will be down on the ground. The tree top canopy zip-lining tour is however extreme sports for us less adventurous types.